The Invention Of Lying is two-thirds of a great movie. It begins with an ingenious, original premise—a man invents the concept of fabrication in a world without lying or impulse control, where everyone blurts out the first thing that comes to mind. It adds a ridiculously loaded cast: Ricky Gervais, who also co-wrote and directed, Louis C.K., Jonah Hill, Tina Fey, Jason Bateman, and a slew of big-name cameos. For much of its duration, The Invention Of Lying is an eviscerating, daring, and refreshingly dark religious satire along the lines of The Life Of Brian, after Gervais’ character invents the notion of God to comfort his dying mom, and is hailed as a prophet for his ability to discern secret truths about the universe. Yet Gervais and his collaborators pull defeat out of the jaws of victory by giving over the film to a DOA romantic subplot in which he woos Jennifer Garner, a woman who obsesses about the DNA of her potential offspring with a fervor that would embarrass Hitler, [yeah, they’re dead-on] and is tactless and obnoxious even by the lenient standards of the film’s alternate universe. Her character is ugly enough on the inside to sink a seemingly foolproof would-be comedy classic—and Gervais’ dogged, weary insistence on pursuing her anyway because she’s beautiful on the outside torpedoes much of the audience’s sympathy for him. 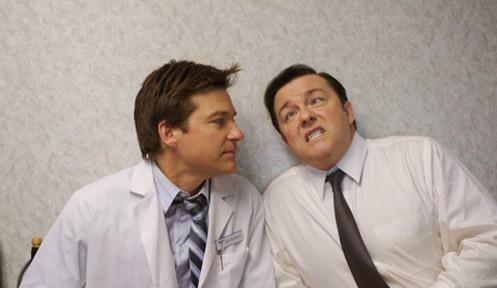 Tags the invention of lying, ricky gervais, So close to a good movie!